Summary: America has wealth and power never before seen in history. Yet the 1% reap the gains of our astonishing productivity while an underclass grows in our cities and rural areas. This post looks at one aspect of this, the price paid by American babies for our national mismanagement. There is no point in getting angry about this — unless you decide to act. Graphics and red emphasis added. What explains the U.S.’s relatively high IMR? This is the subject of a new NBER working paper by researchers Alice Chen, Emily Oster, and Heidi Williams, “Why is Infant Mortality Higher in the U.S. Than in Europe?” (NBER, September 2014). There are numerous theories as to why the IMR is higher in the U.S. than in other countries. There may be reporting differences for infants born near the threshold of viability, with the U.S. more likely to count them as live births while other countries are more likely to count them as miscarriages or stillbirths. Babies in the U.S. also may have lower birth weight or a lower gestational age at birth, predisposing them to worse outcomes. U.S. babies may experience a higher neonatal mortality rate (deaths within the first month of life) or higher post-neonatal mortality rate (deaths in months 1 – 12) than do babies of similar birth weight and gestational age in other countries. To quantify the importance of these potential sources of the U.S. IMR disadvantage, the authors combine natality micro-data from the U.S. with similar data from Finland and Austria. These countries provide a useful comparison because Finland has one of the lowest IMRs in the world and Austria has an IMR similar to much of continental Europe. To address the reporting difference issue, the authors limit their sample to infants born after 22 weeks of gestation with birth weight over 500 grams, since births are required to be reported above these thresholds. They also limit the analysis to singleton births, as access to reproductive technologies has increased the frequency of multiple births, which have higher mortality rates. How much of the remaining U.S. IMR disadvantage can be explained by the other three factors? To explore this, the authors conduct a counterfactual exercise, as reported in the figure. The first column shows the IMR difference for singleton births after 22 weeks and above 500 grams – 1.70 for the U.S. versus Austria and 2.00 for the U.S. versus Finland. The next column reports what the IMR difference would be if the U.S. infants had the same birth weight and gestational age distribution as babies born in Austria or Finland but the relationship between birth conditions and mortality remained what it is in the U.S. currently. Under this scenario, the U.S.-Finland IMR difference would decline by 75%, to 0.53 deaths per 1000 live births, due to the higher birth weight and later gestational age of Finnish infants. By contrast, the U.S.-Austria IMR difference would decline by 30%, to 1.14, because birth conditions in Austria are only modestly better than those in the U.S. The remaining two columns show what the IMR difference would be if U.S. infants had the same birth conditions as they do currently but experienced the neonatal or post-neonatal mortality rate of Austrian or Finnish infants. Conditional on birth conditions, the neonatal mortality rate in the U.S. is similar to that in Austria and actually lower than that in Finland, so making this change does not reduce the IMR difference. However, the post-neonatal mortality rate is much lower in Austria than the U.S., so the U.S.-Austria IMR difference would fall by two-thirds, to 0.57, if the U.S. had Austria’s postneontal mortality rate. Applying Finland’s mortality rate, the U.S.-Finland IMR difference would fall by one-third, to 1.26. In short, worse conditions at birth and a higher post-neonatal mortality rate are both important contributors to the U.S.’s higher IMR. The authors conclude, “these new facts suggest that a sole focus on improving health at birth (for example, through expanding access to prenatal care) will be incomplete, and that policies that target less advantaged groups in the post-neonatal period may be a productive avenue for reducing infant mortality in the U.S.” As an example of a potential policy lever, they point to home nurse visiting programs, which have been shown to reduce post-neonatal mortality rates in randomized trials. Why Americans should love Tolkien’s Lord of the Rings – we live there. Back to the future in New America: our new class structure. Learning not to trust each other in America, and not to trust America. The 1% won a counter-revolution while we played. We forgot that we are the crew of America, not passengers. Next Post The one review for all this summer’s hottest blockbusters! The US IMR is also higher than the Cuban IMR which is 5, and thats with a 50 year embargo on medicines and medical equipment. Wow. Thanks for flagging this (although it’s a sickening comparison). Cuba: per capita GDP of $19 thousand, infant mortality rate of 5 per 100 thousand. USA: per capita GDP of $56 thousand, infant mortality rate of 6.
Who cares more about their people? Which is better run in the interests of their people? That shows an important but little-known fact: the US health care system is (like its finance system) to some extent a parasite — consuming resources disproportionate to its value-added. Other nations have equally good health care systems without its health-care workers (esp doctors) being far better compensated that others with similar years of education. Cuba is the extreme demonstration of this. “Cuba’s medical breakthroughs have caught U.S. attention“, Tampa Tribune, 2 August 2015.
like really, these people are working with subpar 40 year old equipment, on a budget 15 times smaller and they find a vaccine for the most lethal type of cancer worldwide. People with cancer are a great business in the US system. lets be serious. educated in order to provide the Cuban people the best health level possible. The rest is history. with someone that does medicine to heal and care for people. Thanks for the links. I have seen nothing about this! Comments: 1) The lack of an Aids vaccine fits into the pattern. Drug sales can go on for 25 yrs or more. 2) Big Pharma is powerful enough to influence journal articles. We are losing true science under extreme capitalism as biology was affected under communism (Lysenko). 3) IMO medical care was in a Third Sector about 40 yrs ago being neither pure capitalist or socialist (mostly non-profit). Doctors fees and hospital costs were strongly influenced by tradition. There was nothing like the huge disparity in cost/benefit compared to other countries. That graph is quite bogus, and has been known to be so since 2012. Please be more careful when playing with Google, and try to have some skepticism about what you read. He got it from Dr. Fischbeck, an engineering professor who runs an Internet database called DeathRiskRankings.com — which no longer exists at that URL. Dr. Fischbeck’s health care spending figures were drawn from “WHO’S GOING BROKE? COMPARING HEALTH CARE COSTS IN TEN OECD COUNTRIES” by Christian Hagist and Laurence J. Kotlikoff, December 2005. 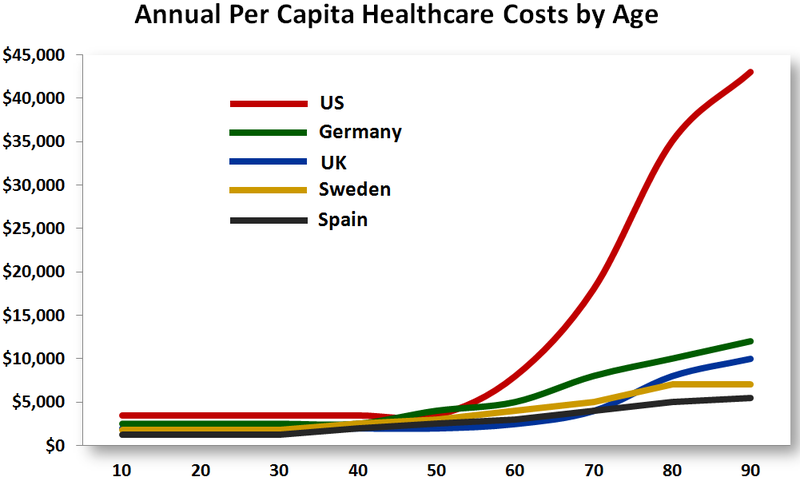 Accordingly, it does not include the lion’s share of healthcare spending for those under 65, skewing the chart. The Kotlikoff paper did not chart them together presumably because the data was from different years, currencies, etc. It also mentions that of the 10 countries studied, the US was at one extreme, Austria, Germany, Spain, and Sweden at the other, and Japan, Norway, the UK, Canada, and Australia are in between. This chart conveniently removes the in between countries to make the US appear more extreme. I don’t know how Prof. Fischbeck chose to normalize the 5 cherry-picked countries for one chart, but it doesn’t appear he had data do do so accurately. Do you have a point for this datafest? Just dumping graphs here doesn’t help. Especially since you have no idea if they’re accurate or not, or what they mean. I can save you time playing with Google. These matters are thoroughly documented in other posts here. The point was to discuss the implications of the data relative to the topic being discussed, and including their veracity. In fact, following up a bit looks pretty interesting and educational to me, including comments by Munro and Fischbeck and discussions about the problems with the chart. I certainly didn’t intend for the chart to be considered definitive. Your comments were going into the spam trap. Did you get an “in moderation notice”? This sometimes happens. I get a thousand or so spams per week (that’s just the questionable spams, not including the obvious ones), so it’s necessary to crank its sensitivity to the max. Sometimes — fortunately rarely — it just decides to trap innocent comments, for mysterious reasons. Just post a note and I’ll retrieve them. This class of problem will only grow worse as we rely more on arrhythmic driven machines. Soon we’ll be arguing with our toasters, and have our self-driving cars refuse to take us where they believe we shouldn’t go. Your comments are now up. I couldn’t get them out of the spam trap using my ipad ap; had to use my home pc. it’s not that the discussion isn’t interesting. it’s just that readers need some comment to know why you believe that links are worth looking at. Otherwise nobody will click on them. According to the CDC, the infant mortality rate in the U.S. is more than twice as high for blacks as for whites. Perhaps there is a socio-economic contribution to that, but the rate for Hispanics is the same as for whites. So I suspect that the socio-economic effect in this study is mostly an effect of race. Is there any evidence that infant mortality has anything to do with the health care system? I am not aware of any. Another factor to consider would be age of the mother. Thank you very much for that link! That’s the kind of comment that creates value — things many of us don’t know, with supporting link. That’s an interesting perspective. To skew the data so strongly by socio-economic class, the racial effect must be large. There is almost certainly research about this! As for infant mortality being affected by health care system — yes, there is a proven large effect. For example (from memory), home visits by nurses have a big effect when used in Europe. Needless to say, the odds of that happening in the US inner cities range from zero to not-gonna-happen. I was a social worker in Appalachia. We wouldn’t do home visits. I was told that the police would not there alone; calls to do so got “10-7” (out of service). At least one program does exist, with randomized, control trials showing success (one study showing $5.70 return on every dollar invested), although I haven’t seen anything that shows benefits specifically w/r/t infant mortality. Obviously, disparities in healthcare access in the U.S. affects demographic disparities in infant mortality, although that wouldn’t seem to explain the data presented on the differences between non-Hispanic Blacks and Blacks. 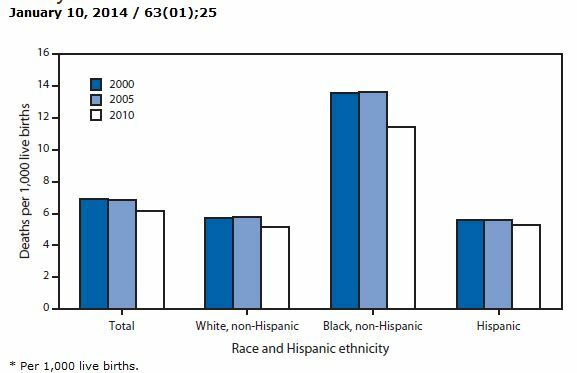 Do you think that would explain the “Latino Health Paradox?” w/r/t infant mortality? Are Black mothers younger on average than Hispanic mothers? That nurse family partnerships sounds like something that might well be helpful. Of course, it is a very different thing from what is usually meant by “health care” in political discussions. I find myself wondering if what it is doing, in part, is providing some of the wisdom and support traditionally provided by grandma (or other relatives) and that is so often missing these days. If you click on “fact sheets” there is a link for a document on “Memphis trial outcomes” that claims reduced mortality for both infant and mother. Unfortunately, no information on sample size, so there is really no way to judge the numbers. I never heard of the Latino Health Paradox. I am no expert on this subject. True, but that’s a relatively recent development. Personal relationships with the patient was seen as a critical part of medicine in 19th and most of 20th century western medicine. As incomes and profits rose throughout the health care industry, the system optimized to lower costs by substituting drugs and such for the now-expensive labor. ==> “Of course, it is a very different thing from what is usually meant by “health care” in political discussions. The economic advantages of what would seem like expensive home visit programs (for “super-utilizers”) are pretty stunning. Makes some sense – I wonder if a similar aspect might help explain the epidemiological paradox mentioned above. Interesting anecdotal story. My “daughter-in-law” had a medical emergency recently when traveling in Cambodia. When she was in the hospital there, all the nurses did was dispense medication. (They also lacked some basic nursing skills…she’s a nurse herself and she had to deal with on her own with an air bubble in her IV because the nurses didn’t know what to do about it). “Nursing,” as we might think of it, is generally done by family members of the patients in Cambodia …to the point where the family is expected to provide food – the hospital didn’t give her food. It would be interesting to see how many infant deaths occurred while in the care of a parent vs. in a child care facility, and whether that plays a role in a higher American IMR? By child care facility do you mean a hospital, or some sort of orphanage/foster care? Laughing at FB now (in a playful way of coarse). Child care facility or daycare facility, the places where millions of children are raised so mom can go back to work. Often these places are brought under fire for the poor care they provide to children under a year of age and the news occasionally reports on deaths of infants in these places. Just a question of curiosity about weather or not that factors into the situation; or how the US compares to some of the other countries mentioned in the post for percent of children in daycare vs. at home and what the IMR rates are between the two. That is an interesting point, but I wonder how well the *usage* of child care explains the socioeconomic difference in results. Poor and rich have access to child care, but not remotely of the same quality. I was wondering how many of the deaths occurred in health care facilities, and how that number varied by class. That might point to access to care as a major variable. Absolutely agree there would probably be quite a difference in either situation depending on income level.